Since the seminal study by Chun and Jiang (Cognitive Psychology, 36, 28–71, 1998), a large body of research based on the contextual-cueing paradigm has shown that the cognitive system is capable of extracting statistical contingencies from visual environments. Most of these studies have focused on how individuals learn regularities found within an intratrial temporal window: A context predicts the target position within a given trial. 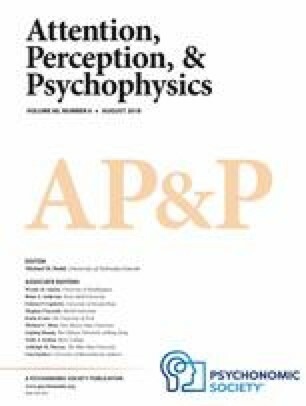 However, Ono, Jiang, and Kawahara (Journal of Experimental Psychology, 31, 703–712, 2005) provided evidence of an intertrial implicit-learning effect when a distractor configuration in preceding trials N − 1 predicted the target location in trials N. The aim of the present study was to gain further insight into this effect by examining whether it occurs when predictive relationships are impeded by interfering task-relevant noise (Experiments 2 and 3) or by a long delay (Experiments 1, 4, and 5). Our results replicated the intertrial contextual-cueing effect, which occurred in the condition of temporally close contingencies. However, there was no evidence of integration across long-range spatiotemporal contingencies, suggesting a temporal limitation of statistical learning. Our visual environment contains much more information than individuals can consciously process at a given time. From this complexity, how does the cognitive system quickly select the most relevant aspects of the scene to allow for adaptive behaviors? It is widely accepted that the efficiency of visual processing results, at least in part, from the exploitation of regularities and in particular spatiotemporal contingencies available in the world. During driving, for example, the activation of a scene schema related to the current context guides our gaze toward the zone where one is likely to find a road sign or a traffic light. Over the past 2 decades, accumulating evidence has highlighted the remarkable ability of human observers to extract and use subtle spatial and/or temporal statistical redundancies (e.g., Baker, Olson, & Behrmann, 2004; Chun & Jiang, 1998; Erickson & Thiessen, 2015; Hunt & Aslin, 2001; Olson & Chun, 2001; Turk-Browne, & Scholl, 2009; for recent reviews, see Armstrong, Frost & Christiansen, 2017; Aslin & Newport, 2012; Thiessen, 2017). These statistical learning phenomena have often been shown to result from implicit learning, since they take place without instruction, without the intention to learn, and in such a way that individuals are often unable to verbally report or consciously access the resulting knowledge (e.g., Colagiuri & Livesey, 2016; Turk-Browne, Junge, & Scholl, 2005; Turk-Browne, Scholl, Chun, & Johnson, 2009; for a review, see Goujon, Didierjean, & Thorpe, 2015). However, research in this field has also suggested certain limitations and constraints on statistical learning. One hypothesis proposed in the literature is that statistical learning is limited to chunking phenomena and confined to regularities related to elements that are temporally and spatially adjacent (e.g., Perruchet & Pacton, 2006; Perruchet & Vinter, 2002). In this framework, the present study aimed to examine the extent to which statistical learning pertains to spatial conditional relationships between elements that are or are not temporally adjacent. The contextual-cueing paradigm is based on the use of a visual-search task in which regularities that predict one of the target’s characteristics (e.g., its location or identity) are integrated into the search display. Participants are exposed to these regularities throughout the task. In the typical task, for example (Chun & Jiang, 1998), participants are instructed to search for a T rotated 90 degrees to the right or left, among 11 L distractors. The search task consists of 30 blocks containing 12 predictive trials and 12 nonpredictive trials. In the predictive trials, the same 12 configurations are repeated once in each block, while new configurations are randomly generated in each nonpredictive trial. After a few blocks, the target is usually detected more quickly in the predictive trials than in the nonpredictive trials. These shorter reaction times in the predictive trials compared with the nonpredictive trials indicate a statistical learning effect, known as the contextual-cueing effect. The key signature of contextual cueing is that it often occurs in the absence of explicit memory. At the end of the visual-search task, participants rarely report having noticed that some contexts were repeated during the task, and their performance in direct memory tasks (i.e., in recognition tasks or target-generation tasks, is usually within chance level; e.g., Chun & Jiang, 1998, 2003). Since Chun and Jiang’s (1998) original study, contextual-cueing effects have been reported with various types of contextual regularities, such as the identity of the distractors (e.g., Chun & Jiang, 1999; Endo & Takeda, 2004), their semantic category (e.g., Goujon, Didierjean, & Marmèche, 2007, 2009), and their dynamic relations between contextual elements (Chun & Jiang, 1999). In the past 2 decades, hundreds of studies aimed at exploring contextual cueing, and especially spatial contextual cueing, have been reported in the literature (see Goujon et al., 2015, for a review). Most of this research has focused on the learning of regularities contained within an intratrial temporal window (i.e., the context predicts the target position within a given trial). In everyday life, however, regularities often pertain to the temporal unfolding of a sequence of events (for a study on sequence learning and contextual cueing, see Jiménez & Vázquez, 2011). For example, clues presented in a context N − 1 often predict the location of a target presented in a subsequent context. In a driving situation, contextual clues allow drivers to anticipate future events, which direct their attention toward potentially relevant areas, despite a huge amount of noise and irrelevant information for the driving task. In this framework, the present study aimed to examine the temporality of spatial contingencies in the field of contextual cueing. To our knowledge, the only study that has addressed this issue (Ono, Jiang, & Kawahara, 2005) provided evidence of intertrial-learning effects when the configuration of distractors and the target in preceding trials N − 1 predicted the target location in trials N. As with the typical intratrial contextual-cueing task, learning occurred without evidence of explicit memory. However, there was no learning when only the target or only the distractor layout in trials N − 1 was predictive of the target location in trials N. In other words, a noise introduced in trials N − 1 (random cues) prevented intertrial learning from taking place. According to Ono et al. (2005), these results show that our visual system can extract consistent associations (ubiquitous statistical learning), but this extraction is impeded by interfering noise. The authors called this effect noise-sensitive statistical learning. In the present study, we attempted to gain further insight into these potential limits of statistical learning by examining whether intertrial learning can take place despite interfering noise. Five experiments were conducted in which the relationship between a repeated configuration and the associated target location in a subsequent trial was impeded by interfering task-relevant noise or by a long delay. Experiment 1 was designed to replicate the intertrial effect reported by Ono et al. (2005). Experiments 2 and 3 were designed to test whether contextual-cueing effects can be extended to spatial contingencies that are not temporally adjacent. In this case, the target location in trials N was no longer predicted by a repeated context in trials N − 1, but was predicted by a repeated context in trials N − 2. Experiments 4 and 5 examined whether the intertrial contextual-cueing effect observed in Experiment 1 still occurs when the presentation delay inserted between the repeated configuration (distractors and target) in trials N − 1 and the predicted target in trials N was increased. The aim of Experiment 1 was to replicate intertrial contextual-cueing effects reported by Ono et al. (2005). Mirroring their study, the present experiment included three phases. In the first phase, participants were exposed to training blocks (Epochs 1–5) where the configuration in trials N − 1 (distractors and target positions) predicted the target location in trials N. In the second phase (Epoch 6), the associations between the configuration in trials N − 1 and the target position in trials N were disrupted for half of the participants. For the other half, the associations between the two trials were preserved during the two phases (Epochs 1–6). In the third phase, the participants who were exposed to the associations that were maintained during the two previous phases carried out an explicit memory task, that is, a target-generation task (e.g., Chun & Jiang, 2003). Twenty-four students (mean age = 20 years, SD = 2.5) from the University of Franche-Comté participated in the experiment in exchange for course credit. All volunteered for the experiment and reported normal or corrected-to-normal visual acuity. Participants from this experiment did not take part in the other experiments. Stimuli were displayed on a Dell Latitude E5500 computer. The viewing distance was approximately 60 cm. E-Prime 2 software was used to generate the experimental procedure. Each display contained one T target and 11 L distractors, each subtending approximately 1° × 1,1°. The T was rotated 90° to the left or right, and the Ls were randomly presented in four possible orientations (0°, 90°, 180°, and 270°). The Ls had a tail (approximately 0.3°) in order to make them look more like the Ts1 (see Fig. 1). Items were displayed in randomly selected locations from an invisible 8 × 6 grid 11° × 19°. They were red, blue, or green and were presented on a gray background. There were four items of each color. The locations of the colors were randomly assigned. Participants carried out a visual-search task first. This was immediately followed by an explicit memory task (i.e., a target-generation task). The search task included two phases: a training phase (Epochs 1–5) and a testing phase (Epoch 6). Each epoch consisted of five blocks of trials. Participants were instructed to identify the target orientation and to press the key assigned to that orientation, namely the q key if the target was rotated left, and the l key if it was rotated right. On each visual-search trial, participants initiated an epoch by pressing the space bar. Then, for each trial, a fixation cross was presented in the center of the screen for 500 ms, followed by a search display that remained on the screen until a response was made. After a 500-ms delay, the next search display was presented. Participants were allowed a 2-minute rest in the middle of the experiment (after the 15th block). Participants were not informed that some displays were repeated and that there were associations between one trial and the next. The training session included 25 blocks of trials. Each block contained 18 trials, divided evenly into three types of displays: trials N − 1, trials N, and filler trials, that is, six trials per condition. The six trials N − 1 were generated at the beginning of the experiment (each one involved a different display pattern) and were presented once per block. The entire search display on a trial N − 1, including the distractor locations and the target location, was repeated once in each block (i.e., 25 times during the training phase). For each trial N, the 11 distractors were presented at randomly chosen locations, but the target location was predetermined (each of the six trials involved a different target location). For each pair of trials N − 1 and N, a repeated trial N − 1 was always associated with a specific target location in trial N.2 A filler trial appeared before and after each pair of trials. The distractors and the target location for a given filler trial appeared in random locations (unlike trials N − 1) and was not predictive of the target location in trials N.
The order of the trials in each block was randomized, except that a trial N was always preceded by a trial N − 1. The same training phase was used for each group of participants (see below). Figure 1 shows an example of the trial design for all experiments. Each of the five blocks contained 18 trials divided evenly into three types of displays: trials N − 1, trials N, and filler trials. Two groups of participants were set up for the testing phase: an inconsistent-transfer group and a consistent-transfer group. In the inconsistent-transfer group, the six pairs previously used in the training phase were shuffled block by block, so that their consistent association was disrupted (trials N − 1 induced a wrong expectation concerning the subsequent target location in trials N), even though both a trial N − 1 and the target location in a trial N appeared in each block. In the consistent-transfer group, the consistent associations between trials N − 1 and trials N were preserved. Only the consistent-transfer group carried out the target-generation task. This phase included 12 trials: six consistent pairs of trials N − 1/N and six inconsistent pairs of trials N − 1/N. The six consistent pairs of trials were the same as those used in the training phase (i.e., the configuration of trials N − 1 always predicted the target’s position in trials N). The six inconsistent pairs were generated randomly. In these pairs, the configuration of trials N − 1 did not predict the target’s position in trials N. Participants were told that during the experiment, the configuration of trials N − 1 predicted the target’s location in trials N. The 12 pairs were then randomly presented. Each pair was composed of a trial N − 1 followed by a trial N in which the T-target was substituted by an L-distractor. Using the mouse, the participants had to click where they thought the T-target was located during the experiment. After they located the T-target position, they were asked to indicate how confident they were in their response on a 7-point scale, ranging from 1 (random response) to 7 (totally certain). The mean reaction time (RT) of correct responses to trials N for each participant was calculated. We report only the mean RT data less than two standard deviations from the average (which eliminated 3.22% of the trials) and RT data of correct responses (2.72% error). Results from two participants (one from the consistent-transfer group and one from the inconsistent-transfer group) were too deviant to be included in the analysis (number of incorrect responses more than three standard deviations from the average and/or mean RT more than or less than two standard deviations from the average). Figure 2 shows the average RT obtained in trials N, by epoch (Epochs 1–5 = training phase, Epoch 6 = testing phase) and for each experimental condition (inconsistent transfer vs. consistent transfer). A two-way ANOVA was conducted on mean RT, with epoch (Epochs 1–5) as a within-subjects factor and consistency (inconsistent transfer vs. consistent transfer) as a between-subjects factor. We found a main effect of epoch, F(4, 80) = 20.98, p < .01, ηp2 = .51, no consistency effect, F(1, 20) < 1, ηp2 < .01, and no interaction between epoch and consistency, F(4, 80) < 1, ηp2 = .03. A two-way ANOVA was conducted on mean RT, with epoch (Epoch 5 vs. Epoch 6) as a within-subjects factor and consistency (inconsistent transfer vs. consistent transfer) as a between-subjects factor. We found no epoch effect, F(1, 20) < 1, ηp2 = .02, and no consistency effect, F(1, 20) < 1, ηp2 = .04, suggesting that the overall RT in the two conditions were comparable. However, an interaction between epoch and consistency was observed, F(1, 20) = 15.55, p < .01, ηp2 = .44. Unlike in Ono et al.’s (2005) study, we investigated contextual cueing with a typical design usually used in the contextual-cueing literature (e.g., Chun & Jiang, 1998, 1999, 2003; Jiang & Chun, 2001), that is, we compared RT in the filler trials (i.e., trials in which the target location was not predicted) and RT in trials N (i.e., trials in which the target location was predicted by the context of trial N − 1). Thus, a repeated-measures ANOVA was conducted on mean RT related to all participants (N = 22) during the training phase, with epoch (Epochs 1–5) and the type of trial (filler trials vs. trials N) as within-subjects factors. We found a main effect of epoch, F(4, 84) = 19,77, p < .01, ηp2 = .48, no effect of type of trial, F(1, 21) < 1, ηp2 = .02, but a reliable interaction between epoch and type of trial was observed, F(4, 84) = 4.25, p < .01, ηp2 = .17. This interaction showed that RTs decrease more in the trials-N condition than in the filler-trials condition, suggesting an intertrial contextual cueing effect. The results are summarized in the Appendix, which presents the mean RT for each condition as a function of epoch. For each trial, we compared the distance (in pixels) between the target position indicated by the participant and the real position. The difference between the consistent trials (M = 347.48, SD = 82.25) and the inconsistent trials (M = 397, SD = 57.57) was marginally significant, t(10) = 2.13, p = .06. The difference between the confidence ratings in the consistent trials (M = 1.75, SD = .37) and in the inconsistent trials (M = 1.69, SD = .41) was not significant, t(10) = 1.25, p = .24. Overall, the results of Experiment 1 replicated those reported by Ono et al. (2005). When the associations between the configuration (distractors and target) in trials N − 1 and the position of the target in trials N (Epoch 6) were abolished in a testing phase, the RT increased significantly, that is, by 305 ms in the present experiment. These results and the comparison between RT in the filler trials and RT in trials N suggest learning of intertrial associations during the training phase. The results of the target-generation task show a marginally reliable difference between the consistent and inconsistent conditions. Thus, we cannot provide a clear conclusion regarding the implicit or explicit nature of the learning that took place in the search task. It is noteworthy that this tendency differs from the results reported by Ono et al. (2005), which showed that, in a recognition task, none of the participants reported having noticed that certain intertrial pairings were repeated. This difference between the two studies suggests that a target-generation task is more sensitive to explicit memory than a recognition task is, which is typically used in contextual-cueing research (for discussions, see Colagiuri & Livesey, 2016; Goujon, Didierjean, & Poulet, 2014; Smyth & Shanks, 2008; Vadillo, Konstantinidis, & Shanks, 2016). Experiment 2 was designed to test the effect of an interfering visual event inserted between two associated trials (namely N − 2 and N). We introduced a filler trial between each pair of trials N − 1 and N. Here, the configuration (distractors and target) in trials N − 2 predicted the position of the target in trials N.
Twenty students (mean age = 20 years, SD = 4.7) from the University of Franche-Comté performed a visual-search task. All participants volunteered for the experiment in exchange for course credit and reported normal or corrected-to-normal visual acuity. Participants from this experiment did not take part in the other experiments. The material and the procedure were the same as in Experiment 1, except that the predictive associations were no longer introduced between trials N − 1 and N, but between trials N − 2 and N. The configuration (distractors and target) in a trial N − 2 was repeated across the blocks, as well as the associated target location in a trial N. However, trials N − 1 consisted of filler trials. The configuration in those trials was random and was thus not repeated across the blocks. Given the complexity of the following tasks compared with the Experiment 1 task (in which we failed to show any explicit learning), no generation task was used in Experiments 2 to 5. We calculated the mean RT for correct responses to trials N for each participant. Here, we included only the mean RT data that were within two standard deviations away from the average (thus eliminating 4.17% of the overall trials) and RT of correct responses (2.49% error). Results from one participant (from the inconsistent transfer group) were too deviant to be included in the analysis (number of incorrect responses more than three standard deviations from the average). Figure 3 shows the average RT obtained on trials N, by epoch (Epochs 1–5 = training phase, Epoch 6 = testing phase) and by experimental condition (inconsistent transfer vs. consistent transfer). A two-way ANOVA was conducted on the mean RT, with epoch (Epochs 1–5) as the within-subjects factor and consistency (inconsistent transfer vs. consistent transfer) as the between-subjects factor. We found a main effect of epoch, F(4, 68) = 7.25, p < .01, ηp2 = .30, no consistency effect, F(1, 17) < 1, ηp2 = .02, and no interaction between epoch and consistency, F(4, 68) < 1, ηp2 = .02. A two-way ANOVA was conducted on the mean RT, with epoch (Epoch 5 vs. Epoch 6) as the within-subjects factor and consistency (inconsistent transfer vs. consistent transfer) as the between-subjects factor. We found no epoch effect, F(1, 17) = 1.57, p = .23, ηp2 = .08, and no consistency effect, F(1, 17) < 1, ηp2 < .01, suggesting that the overall RTs in the two conditions were comparable. There was no interaction between epoch and consistency, F(1, 17) = 1.1, p = .31, ηp2 = .06. A repeated-measures ANOVA was conducted on mean RT observed for all participants (N = 19) during the training phase, with epoch (Epochs 1–5) and the type of trial (filler trials vs. trials N) as within-subjects factors. We found a main effect of epoch, F(4, 72) = 20,49, p < .01, ηp2 = .53, no type of trial effect, F(1, 18) = 1,87, p = 0,19, ηp2 = .09, and no interaction between epoch and type of trial, F(4, 72) < 1, ηp2 = .04. The results are summarized in the Appendix, which presents the mean RT for each condition as a function of epoch. To firmly exclude the possibility of intertrial contextual cueing in Experiment 2, we ran additional Bayesian analyses on both the testing phase and the training phase. A Bayesian ANOVA (Love et al., 2015; Rouder, Morey, Speckman, & Province, 2012) conducted on the testing phase (consistent vs. inconsistent) revealed that the main-effects model was preferred to the interaction model by a Bayes factor of 1.49. In other words, this means that the main-effects model was 1.49 times more likely to account for performance than the interaction model. A Bayesian ANOVA conducted on the training phase (filler trials vs. trials N) revealed that the main-effects model was preferred to the interaction model by a Bayes factor of 14.29. According to Jeffreys (1961), a value greater than 3 provides solid evidence in favor of one model over another, in our case H0 (main-effects model) over H1 (interaction-effect model). Therefore, despite the data from the testing phase (that only provides anecdotal evidence against H1), the data from the training phase provided strong evidence against the hypothesis that epoch and the type of trial interacted, consequently favoring the null hypothesis and providing an additional argument against intertrial contextual cueing in Experiment 2. The aim of this experiment was to determine whether intertrial contextual cueing could resist the introduction of an interfering trial inserted between a predictive context in trials N − 2 and the associated target location in trials N. Our results did not indicate any intertrial contextual-cueing effect when the predictive associations were disrupted by an interfering context, which is consistent with previous studies showing that the introduction of interfering noise inserted between the target and the predictive context strongly impairs contextual cueing when the predictive relationships are presented within the same display (e.g., Olson & Chun, 2002). Experiment 2 failed to provide evidence of contextual cueing when an interfering trial (N − 1) disrupted the predictive relationship between a repeated context (in trials N − 2) and the target location (in trials N). Yet research using different visual statistical learning paradigms (e.g., Turk-Browne, Isola, Scholl, & Treat, 2008) have shown that implicit learning can take place on nonadjacent contingencies, as long as the intervening items between the related elements do not share the same task-relevant feature (e.g., when they constitute another color scheme). In this framework, we conducted a third experiment to examine contextual cueing on nonadjacent spatiotemporal contingencies when the interfering noise between the related elements was presented in a different color scheme (see Fig. 1). In trials N − 2 and N, the distractors and the target were in color, whereas they were black and white in trials N − 1. Twenty-two students (mean age = 19 years, SD = 2.2) from the University of Franche-Comté performed a visual-search task. All participants volunteered for the experiment in exchange for course credit and reported normal or corrected-to-normal visual acuity. Participants from this experiment did not take part in the other experiments. The procedure was the same as in Experiment 1, except that the configurations (distractors and target) in trials N − 1 (filler trials) were contrasted with the configurations in trials N − 2 and trials N. The 11 L-distractors and the T-target in trials N − 1 were all presented in black and white (half blacks, half whites), whereas the items that composed the displays in trials N − 2 and N were in color. Participants were told that during the experiment, the configurations could be composed of different colors, but that in any case, the task was to find the T-target as quickly as possible. We calculated the mean RT for correct responses to trials N for each participant. Here, we report only the mean RT data fewer than two standard deviations from the average (which eliminated 2.92% of the trials) and RT of correct responses (1.83% error). Results from one participant (from the consistent-transfer group) were too deviant to be included in the analysis (number of incorrect responses more than three standard deviations from the average and mean RT over or below two standard deviations from the average). Figure 4 shows the average RT obtained in trials, by epoch (Epochs 1–5 = training phase, Epoch 6 = testing phase) and experimental condition (inconsistent transfer vs. consistent transfer). A two-way ANOVA was conducted on mean RT, with epoch (Epochs 1–5) as the within-subjects factor and consistency (inconsistent transfer vs. consistent transfer) as the between-subjects factor. We found a main effect of epoch, F(4, 76) = 16.23, p < .01, ηp2 = .46, no consistency effect, F(1, 19) < 1, ηp2 = .01, and no interaction between epoch and consistency, F(4, 76) < 1, ηp2 = .02. A two-way ANOVA was conducted on mean RT, with epoch (Epoch 5 vs. Epoch 6) as a within-subjects factor and consistency (inconsistent transfer vs. consistent transfer) as a between-subjects factor. We found no epoch effect, F(1, 19) = 2.24, p = .15, ηp2 = .10, and no consistency effect, F(1, 19) < 1, ηp2 = .05, suggesting that the overall RT in the two conditions were comparable. Again, there was no interaction between epoch and consistency, F(1, 19) < 1, ηp2 = .03. A repeated-measures ANOVA was conducted on the mean RT observed for all participants (N = 21) during the training phase, with epoch (Epoch 1–5) and the type of trial (filler trials vs. trials N) as within-subjects factors. We found a main effect of epoch, F(4, 80) = 15,93, p < .01, ηp2 = .44, a type of trial effect,3 F (1, 20) = 4,73, p < .05, ηp2 = .19, and no interaction between epoch and type of trial, F(4, 80) < 1, ηp2 = .04. The results are summarized in the Appendix, which presents the mean RT for each condition as a function of epoch. To firmly exclude intertrial contextual cueing in Experiment 3, we ran additional Bayesian analyses on both the testing phase and the training phase. A Bayesian ANOVA conducted on the testing phase (consistent vs. inconsistent) revealed that the main-effects model was preferred to the interaction model by a Bayes factor of 2.04. A Bayesian ANOVA conducted on the training phase (filler trials vs. trials N) revealed that the main-effects model was preferred to the interaction model by a Bayes factor of 11.11. Therefore, despite the data from the testing phase (that only provide anecdotal evidence against H1), the data from the training phase provide strong evidence against the hypothesis that epoch and the type of trial interacted, consequently favoring the null hypothesis and providing an additional argument against intertrial contextual cueing in Experiment 3. The goal of Experiment 3 was to determine whether contextual cueing based on conditional spatial relations between elements that are not temporally adjacent could be observed when an interfering trial was presented in a different color scheme. Although such statistical learning effects have been reported with a different paradigm (e.g., Turk-Browne et al., 2008), Experiment 3 failed to provide evidence of such an effect with an intertrial contextual-cueing procedure. As is the case with a typical procedure of intratrial contextual cueing (e.g., Conci & von Mühlenen, 2011; Olson & Chun, 2002), intertrial contextual cueing seems to be highly sensitive to interference. To better evaluate the impact of an interfering trial inserted between two associated trials and to increase the power of our statistical analyses, we combined the data from Experiment 2 (n = 19) and Experiment 3 (n = 21), increasing our sample size to 40 participants. Indeed, except the color of the display, both tasks and displays used in Experiment 2 and Experiment 3 were identical. A two-way ANOVA was conducted on mean RT, with epoch (Epochs 1–5) as the within-subjects factor and consistency (inconsistent transfer vs. consistent transfer) as the between-subjects factor. We found a main effect of epoch, F(4, 152) = 20.22, p < .01, ηp2 = .35, no consistency effect, F(1, 38) < 1, ηp2 = .01, and no interaction between epoch and consistency, F(4, 142) < 1, ηp2 = .005. A two-way ANOVA was conducted on mean RT, with epoch (Epoch 5 vs. Epoch 6) as a within-subjects factor and consistency (inconsistent transfer vs. consistent transfer) as a between-subjects factor. Here again, we found no epoch effect, F(1, 38) < 1, ηp2 = .003, and no consistency effect, F(1, 38) < 1, ηp2 = .01, suggesting that the overall RT in the two conditions were comparable. Again, there was no interaction between epoch and consistency, F(1, 38) < 1, ηp2 = .01. A repeated-measures ANOVA was conducted on mean RT of all participants (N = 40) during the training phase, with epoch (Epochs 1–5) and the type of trial (filler trials vs. trials N) as within-subjects factors. We found a main effect of epoch, F(4, 156) = 35,89, p < .01, ηp2 = .48, a type of trial effect,4 F(1, 39) = 6,61, p < .05, ηp2 = .14, and no interaction between epoch and type of trial, F(4, 156) = 1,31, p = .27, ηp2 = .03. The results are summarized in the Appendix, which presents the mean RT for each condition as a function of epoch. A Bayesian ANOVA conducted on the testing phase (consistent vs. inconsistent) revealed that the main-effects model was preferred to the interaction model by a Bayes factor of 3.13. A Bayesian ANOVA conducted on the training phase (filler trials vs. trials N) revealed that the main-effects model was preferred to the interaction model by a Bayes factor of 20. Therefore, the data from both the testing phase and the training phase provided solid evidence (moderate for the testing phase and strong for the training phase) against our alternative hypotheses (interaction-effect model), consequently favoring the null hypotheses and providing an additional argument against intertrial contextual cueing in Experiments 2 and 3. Taken together, our results confirm that the introduction of interfering task-relevant material between the two related elements (context–target) seems to prevent learning. However, an alternative hypothesis is that a long delay between trials N − 2 and trials N does not allow for associating the repeated context with the target location. This hypothesis was examined in Experiments 4 and 5. The aim of this experiment was to investigate whether intertrial contextual cueing could occur with a longer delay inserted between the repeated configuration (distractors and target) in trials N − 1 and the predicted target in trials N. The procedure was the same as in Experiments 2 and 3, except that the interfering filler trials were suppressed and replaced by a 3,100-ms delay between the end of a predictive context in trials N − 1 and the beginning of the associated trials N (instead of 500 ms in Experiment 1), that is, the average duration of the filler trials (trials N − 1 and fixation crosses) in Experiments 2 and 3. Furthermore, because there were no filler trials in the present experiments (replaced by a simple delay), contextual cueing could not be examined using the standard method (i.e., a repeated-measures ANOVA on mean RT), with epoch (Epoch 1 vs. Epoch 5) as a within-subjects factor and the type of trials (filler trials vs. trials N) as a within-subjects factor. Therefore, contextual cueing was solely examined with the transfer phase. Note that this method was also used by Ono et al. (2005). To nevertheless increase the statistical power of the next analyses, and to ensure that any subtle learning effect would be revealed, the number of participants was increased in Experiments 4 and 5. Forty students (mean age = 20 years, SD = 1.6) from the University of Franche-Comté performed a visual-search task. All participants volunteered for the experiment in exchange for course credit and reported normal or corrected-to-normal visual acuity. Participants from this experiment did not take part in the other experiments. The procedure was the same as in Experiments 2 and 3, except that the filler trials were suppressed and replaced by a 3,100-ms delay (fixation cross) between the end of trials N − 1 and the beginning of trials N.
We calculated the mean RT of correct responses in trials N for each participant. Here, we report only the mean RT data less than two standard deviations from the average (which eliminated 4.05% of the trials) and the RT of correct responses (4.12% error). Results from four participants (two from the consistent-transfer group and two from the inconsistent-transfer group) were too deviant to be included in the analysis (number of incorrect responses ore than three standard deviations from the average and/or mean RT over or below two standard deviations from the average). Figure 5 shows the average RT obtained in trials N by epoch (Epochs 1–5 = training phase, Epoch 6 = testing phase) and by experimental condition (inconsistent transfer vs. consistent transfer). A two-way ANOVA was conducted on mean RT, with epoch (Epochs 1–5) as the within-subjects factor and consistency (inconsistent transfer vs. consistent transfer) as the between-subjects factor. We found a main effect of epoch, F(4, 136) = 17.33, p < .01, ηp2 = .34, no consistency effect, F(1, 34) < 1, ηp2 < .01, and no interaction between epoch and consistency, F(4, 136) < 1, ηp2 = .02. A two-way ANOVA was conducted on mean RT, with epoch (Epoch 5 vs. Epoch 6) as a within-subjects factor and consistency (inconsistent transfer vs. consistent transfer) as a between-subjects factor. We found no epoch effect, F(1, 34) = 3.33, p = .076, ηp2 = .09, and no consistency effect, F(1, 34) < 1, ηp2 < .01, suggesting that the overall RT in the two conditions were comparable. We also found no interaction between epoch and consistency, F(1, 34) < 1, ηp2 < .01. A Bayesian ANOVA conducted on the testing phase (consistent vs. inconsistent) revealed that the main-effects model was preferred to the interaction model by a Bayes factor of 2.8. According to Jeffreys (1961), this Bayes factor could be considered as anecdotal to moderate. Therefore, the data only provided a trend against the hypothesis that epoch and consistency interact, consequently marginally favoring our null hypothesis in Experiment 4. The aim of this experiment was to test the impact of an extended delay between spatial contingencies (i.e., a repeated context and the target location) in the intertrial contextual cueing. Experiment 4 did not show evidence of an intertrial contextual-cueing effect when the delay between trials N − 1 and trials N was 3,100 ms. Even though Bayesian analyses failed to firmly discard a residual intertrial contextual cueing in Experiment 4, the present results suggest that a delay of about 3,000 ms between two spatial contingencies dramatically deteriorates (or even prevents) the associative learning. By contrast, intertrial contextual cueing was highly significant with a 500-ms or 1,000-ms delay (see Experiment 1 and Ono et al.’s, 2005, study). To determine the temporal window conducive to intertrial contextual cueing effects, in Experiment 5, the delay between trials N − 1 and trials N was 1,800 ms, which corresponds to the split delay between the one used in Experiment 1 (500 ms) and the one used in Experiment 4 (3,100 ms). Forty students (mean age = 22 years, SD = 6.6) from the University of Franche-Comté performed a visual-search task. All participants volunteered for the experiment in exchange for course credit and reported normal or corrected-to-normal visual acuity. Participants from this experiment did not take part in the other experiments. The procedure was the same as in Experiment 4, except that the delay (fixation cross) between the end of trials N − 1 and the beginning of trials N was 1,800 ms (i.e., the average between the duration of the fixation cross in Experiments 1 and 4). We calculated the mean RT of correct responses in trials N for each participant. Here, we reported only the mean RT data less than two standard deviations from the average (which eliminated 3.87% of the trials) and the RT of correct responses (5.61% error). Results from three participants (two from the consistent-transfer group and one from the inconsistent-transfer group) were too deviant to be included in the analysis (number of incorrect responses more than three standard deviations from the average and/or mean RT over or below two standard deviations from the average). Figure 6 shows the average RT obtained in trials N, by epoch (Epochs 1–5 = training phase, Epoch 6 = testing phase) and by experimental condition (inconsistent transfer vs. consistent transfer). A two-way ANOVA was conducted on mean RT, with epoch (Epochs 1–5) as the within-subjects factor and consistency (inconsistent transfer vs. consistent transfer) as the between-subjects factor. There was a main effect of epoch, F(4, 140) = 22.69, p < .01, ηp2 = .39, no consistency effect, F(1, 35) < 1, ηp2 < .01, and no interaction between epoch and consistency, F(4, 140) = 1.60, p = .17, ηp2 = .04. A two-way ANOVA was conducted on mean RT, with epoch (Epoch 5 vs. Epoch 6) as the within-subjects factor and consistency (inconsistent transfer vs. consistent transfer) as the between-subjects factor. We found no epoch effect, F(1, 35) = 1.83; p = .18, ηp2 = .05, and no consistency effect, F(1, 35) < 1, ηp2 < .01, suggesting that the overall RT in the two conditions were comparable. This time, the interaction between epoch and consistency was significant, F(1, 35) = 6.38, p < .05, ηp2 = .15. An intertrial contextual-cueing effect was observed in Experiment 1 with a delay of 500 ms between trials N and N − 1, but was no longer observed in Experiment 4 with a delay of 3,100 ms. The results of Experiment 5 show that an intertrial contextual-cueing effect can be observed with a delay of 1,800 ms. These results will be discussed in the General Discussion. This study investigated whether intertrial contextual cueing can rely on spatial regularities related to elements that are not temporally adjacent. To this end, we used an intertrial spatial contextual-cueing procedure (Ono et al., 2005) to find out whether contextual cueing occurs when the predictive relationships are impeded by task-relevant interfering distractors or by a long delay. In line with Ono et al.’s (2005) study, Experiment 1 showed a contextual-cueing effect when the configuration (distractors and target) in trials N − 1 predicted the location of the target in trials N (despite a random configuration of distractors in trial N). However, Experiments 2 and 3 failed to provide evidence of an intertrial contextual-cueing effect when a filler trial N − 1 was introduced between a predictive configuration in trial N − 2 and the associated target location in trial N. Experiment 4 also failed to demonstrate an intertrial contextual-cueing effect when the delay between trials N − 1 and trials N was extended to 3,100 ms. However, Experiment 5 yielded an intertrial contextual-cueing effect when the delay between the predictive context in trials N − 1 and the associated target in trials N lasted 1,800 ms.
Taken together, these experiments confirm the existence of intertrial contextual cueing and are consistent with an intertrial noise-sensitive statistical learning model (see Ono et al., 2005). Indeed, spatial contextual cueing was strongly impeded by the introduction of interfering noise between the predictive context and the associated target. Our results offer new insights concerning the noise-sensitive statistical learning account by showing that not only a filler trial but also a longer delay between the two statistically contingent elements (i.e., the context and the location of the target) is sufficient to deteriorate intertrial learning. To learn associations between a configuration in trial N − 1 and the target position in the next trial, these two trials must be close in time. The present results are in line with previous studies showing that spatial contextual cueing is very sensitive to different types of interference (for a review, see Goujon et al., 2015). For example, the introduction of spatially irrelevant material between the target and the predictive repeated context dramatically reduces contextual cueing (e.g., Olson & Chun, 2002). The presence of distractor configurations that respect the Gestalt laws of grouping based on closure, symmetry, size, or color can also produce interfering perceptual effects capable of eliminating contextual cueing (Hoffmann & Sebald, 2005). Our study goes further by showing that a delay of 3,100 ms has similar interfering consequences. These results also corroborate many results already reported in a wider range of studies on statistical learning, suggesting that statistical learning mechanisms are limited to adjacent and close spatiotemporal contingencies. Although the statistical learning literature highlights the remarkable ability of subjects to learn contiguous events across domains and modalities, the learning of nonadjacent dependencies seems possible but is subject to far more restrictive constraints (e.g., Gebhart, Newport, & Aslin, 2009; Newport & Aslin, 2004; Onnis, Monaghan, Richmond, & Chater, 2005). The perceptual and associative constraints in question are compatible with models and theories that reduce statistical learning to chunking effects (for a presentation of chunking mechanisms, see Gobet et al., 2001; Perruchet & Pacton, 2006). Several hypotheses can be proposed to explain the temporal limitations of the intertrial contextual-cueing effect observed here. First, this effect may be linked to the critical role of attention and working memory in the binding processes involved in statistical-learning phenomena. According to chunking models, attention plays a critical role in the formation of cognitive units: perceptual primitives would only be grouped together when they are simultaneously held in a spatial-attention window, which is constrained by working-memory limitations (Jiang & Leung, 2005; Perruchet & Vinter, 1998). In the PARSER model, for example (e.g., Perruchet & Vinter, 1998), the grouping of several primitives requires attention and consolidation, and the forgetting of perceptual units in memory depends on activation, decay, and interference effects. Similarly, Ono et al. (2005) proposed that regularities can be learned without simultaneous statistical contingencies, provided that the “residual” attention allocated to the memory trace of the context in trial N − 1 is sufficient during the presentation of trial N. In this case, the absence of learning would be due to the limited “lifetime” of the residual attention. According to this hypothesis, when trial N − 1 disappears, the residual attention allocated to the memory trace of that trial decays over time, making the association between the configuration in trial N − 1 and the target location in the subsequent trial N much more difficult. The association of two temporally separated trials would require the presence of an attentional bridge, embodied here by the lifetime of the residual attention attributed to the memory of the context in trial N − 1. However, the learning of contextual regularities is based on longer-term memory processes than those involved in “repetition priming” effects (Jiang & Song, 2005). In the field of priming, similar constraints have been reported. Ferrand (1996), for example, demonstrated the existence of a limited lifetime of 500 ms and 1,000 ms in masked-repetition priming. According to the lexical search model (Forster, 1976; Forster & Davis, 1984), exposure to the prime causes the short-term activation of lexical entries related to the prime and allows for faster target recognition, but during a very limited duration. It is likely that in intertrial contextual cueing, exposure to the predictive configuration in trials N − 1 results in short-term mental representation of the configuration (lifetime limited to less than 3,100 ms), and that the simultaneous activation of the target in trials N triggers the intertrial association. A second hypothesis is that two successive contexts are considered by the cognitive system as independent, isolated, and not associated when they are separated by a long delay. According to this hypothesis, there would be a critical time threshold beyond which the cognitive system would consider two successive trials (N − 1 and N) as independent. Thus, even if intertrial regularities could be learned beyond the critical delay of 3,100 ms, the cognitive system might consider the trials’ association as insufficiently relevant (because of their assumed independence) to use for learning. This dissociation between the learning of regularities and the use of those regularities in the task can be aligned with some results obtained with intratrial contextual cueing. Using a typical contextual cueing task, Jiang and Chun (2001) also showed that if the target and distractors do not share the same color, no contextual-cueing effect is observed. But if during the experiment the distractors that contain the regularities suddenly change to be the same color as the target, the contextual-cueing effect immediately appears (Goujon et al., 2009; Jiang & Leung, 2005). These findings suggest that the expression of a learning requires the cognitive system to consider the regularities as relevant and useful to the task at hand. A similar phenomenon might have been in effect here in our study. Finally, if our results show that a delay of 3,100 ms inserted between the two statistically contingent elements is sufficient to deteriorate intertrial learning, then one can ask to what extent other variables (e.g., the nature of the interfering filler trial) would abolish learning in Experiments 2 and 3. More research is needed to determine the relationships between the duration of an interfering filler trial, its nature (e.g., task relevant or not, requiring a high or a low cognitive load), and the emergence of intertrial learning. According to our hypothesis, intertrial learning would require the presence of an attentional bridge between the associated trials. We can hypothesize that the robustness of this attentional bridge (and the associated intertrial learning) would be negatively linked to the duration of the interfering filler trial, its cognitive load, and its relevance (see Jiang & Leung, 2005). An important part of human perception is based on the detection, acquisition, and use of environmental regularities. The contextual-cueing literature shows how the cognitive system is able to learn a number of contextual regularities so as to effectively guide attention. This facilitation in visual searching has mainly been studied with regularities between distractors and a to-be-detected target presented within the same trial. In line with previous studies (Ono et al., 2005), our research confirms the existence of intertrial contextual cueing. However, we failed to provide evidence of integration across long-range spatiotemporal contingencies, suggesting a limitation of statistical learning. To be bound together, elements or events of experience might have to co-occur within a short temporal window. Note, however, that the generalization of contextual cueing effects to other kinds of regularities, such as semantic regularities (Goujon, 2011; Goujon et al., 2007, 2009), has shown that statistical learning can involve more complex associative processes, particularly associative memory, between perceptual or semantic information and response information. In their article, Ono et al. (2005) did not explicitly refer to this feature of the Ls, but it is visible in their Fig. 1 (and also in our Fig. 1). A pilot experiment we conducted using simple Ls failed to replicate their results. Both the 11 distractors and the target location in trials N − 1 (but not the random distractor positions in trials N) were predictive of the target location in trials N since Ono et al. (2005) showed that no intertrial contextual cueing effect was observed when only the target or only the distractors in trial N − 1 configurations predicted the location of the target in trials N.
This type-of-trial effect could be explained by the fact that filler-trial displays are in black and white while trial N displays are colored. As previously stated, this difference could be explained by the fact that some filler-trial displays are in black and white while all the trial N displays are colored.